Product prices and availability are accurate as of 2019-04-12 03:10:49 EDT and are subject to change. Any price and availability information displayed on http://www.amazon.com/ at the time of purchase will apply to the purchase of this product. 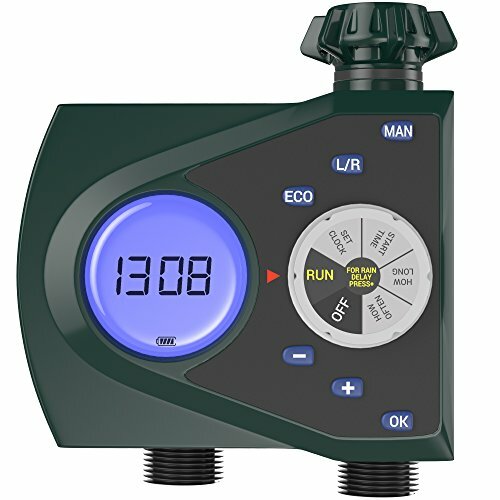 The Gideon Electronic Dual-valve Hose Irrigation Water Timer is designed to make controlling your garden watering simple, easy and extremely flexible; so that it meets your precise customized needs. Features two separate valves with maximum flexibility settings. Attach two hoses, and customize each hose with its own watering duration and frequency according to your precise needs. Use one water timer to control watering your lawn and garden! Allows setting your precise desired frequency and duration. Program precisely when to start watering, when to stop watering. Each watering session can be set for up to 240 minutes, and can be programmed to water as many times needed per day, without limitations. Features a swivel coupling for easy and quick connection without any need for tools. Setup is a breeze with the simple and easy to follow instructions. 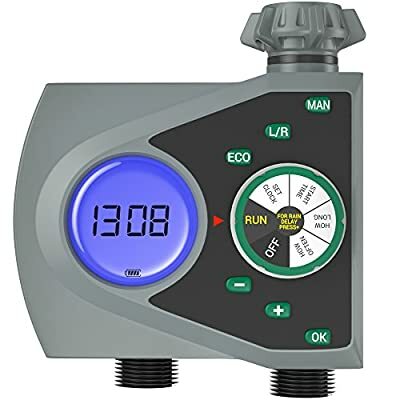 Features a large easy to read, LCD screen, displaying amazingly detailed information; such as when next watering cycle will begin, duration remaining for current watering cycle and much more. Enjoy a lush green lawn, without any worry of overwatering or underwatering! Easily skip watering sessions during and after rainy days, without interrupting the programmed watering cycles. Simply select how many hours/days of watering should be skipped; the system will then pause all watering for the entire duration and will resume its regular watering schedule after the programmed delay setting. Want to wash your car or water your garden manually during an extremely hot day? Simply click on the 'manual' button and set your 'manual' watering session duration, the manual watering will shut by itself at the desired time. / Requires two (2) AA batteries (Not included). / Features an automatic water-shut off valve so that water doesn't run endlessly in the event that the battery's power is depleted. 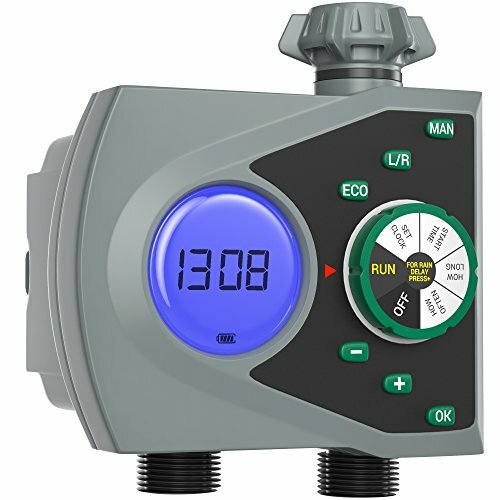 2-PROGRAMMABLE VALVES - Water timer features two separate valves with maximum flexibility settings. Attach two hoses, and customize each hose with its own watering duration and frequency according to your precise needs. 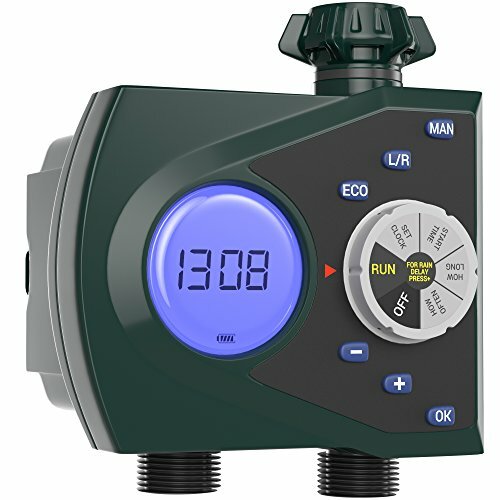 Use one water timer to control watering your lawn and garden! EASY TO USE - Features a swivel coupling for easy and quick connection without any need for tools. Water sprinkler irrigation setup is a breeze with the simple and easy to follow instructions. 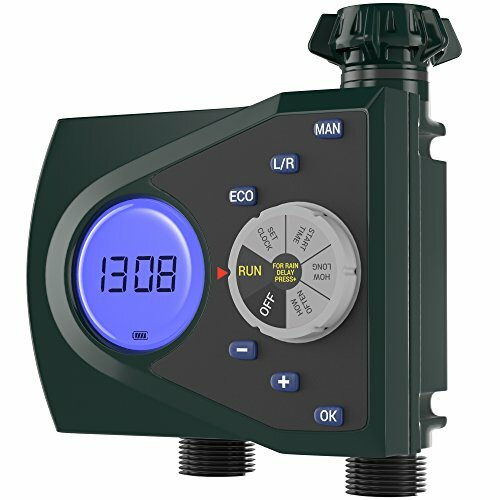 Features a large easy to read, LCD screen, displaying amazingly detailed information; such as when next watering cycle will begin, duration remaining for current watering cycle and much more. Enjoy a lush green lawn, without any worry of overwatering or underwatering! MAXIMUM FLEXIBILITY - Allows setting your precise desired watering frequency and duration. Program precisely when to start watering, when to stop watering. Each garden watering session can be set for up to 240 minutes, and can be programmed to water as many times needed per day, without limitations. RAIN DELAY - Easily skip watering sessions during and after rainy days, without interrupting the programmed watering cycles. Simply select how many hours/days of watering should be skipped; the system will then pause all watering for the entire duration and will resume its regular watering schedule after the programmed delay setting. MANUAL WATERING - Want to wash your car or water your garden manually during an extremely hot day? 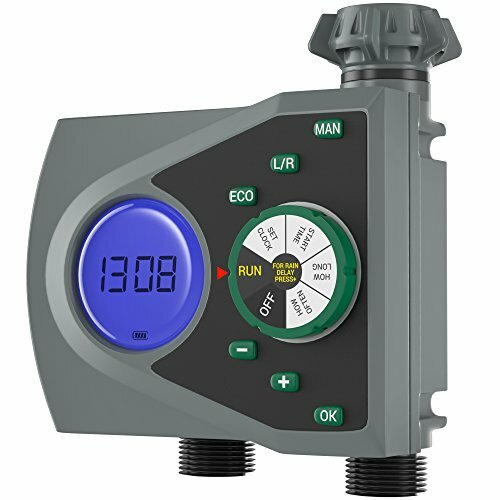 Simply click on the 'manual' button and set your 'manual' watering session duration, the manual watering will shut by itself at the desired time. / Requires two (2) AA batteries (Not included). / Solid quality construction; fully waterproof and rainproof. / Upgraded for enhanced performance.